My parents arrived last weekend to spend some time here in Australia visiting me for Christmas. 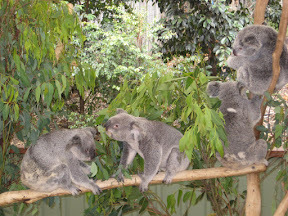 On Saturday, we went to the Lone Pine Koala Sanctuary, a fantastic little zoo just outside of Brisbane. It's not a huge, fancy, plastic zoo. The parking lot only holds a hundred cars or so, and there were probably only 200 people there the day we were there. What's really great about it is that you can get in close with the animals. 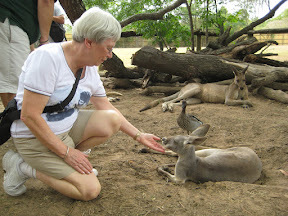 They have a big open park area that you can walk through where over 100 kangaroos live. You can just wander around with the kangaroos, walk up to them, feed them, and pet them. At first my mom was a little scared that they would be aggressive when you walked up to them, but they were very calm. Most of the time they wouldn't pay much attention, but if you had some food in your hand they would sniff it out and start munching away, and then you could pet them. For some reason, however, the kangaroos were scared of my dad. The prime attraction of the Lone Pine Koala Sanctuary is—you guessed it—koalas. 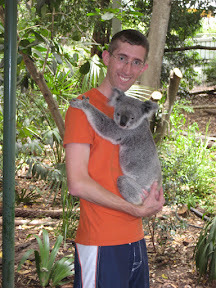 One of the things to do is to (pay extra to) get your picture taken holding a koala. My little koala, which you can see in the picture at the start of this entry, was a female koala named Vinnie. She was very gentle with me, and didn't dig her claws into me at all. She had a very soft coat. Sadly, they wouldn't let me take her home with me. I don't think my garden has eucalyptus leaves anyway. 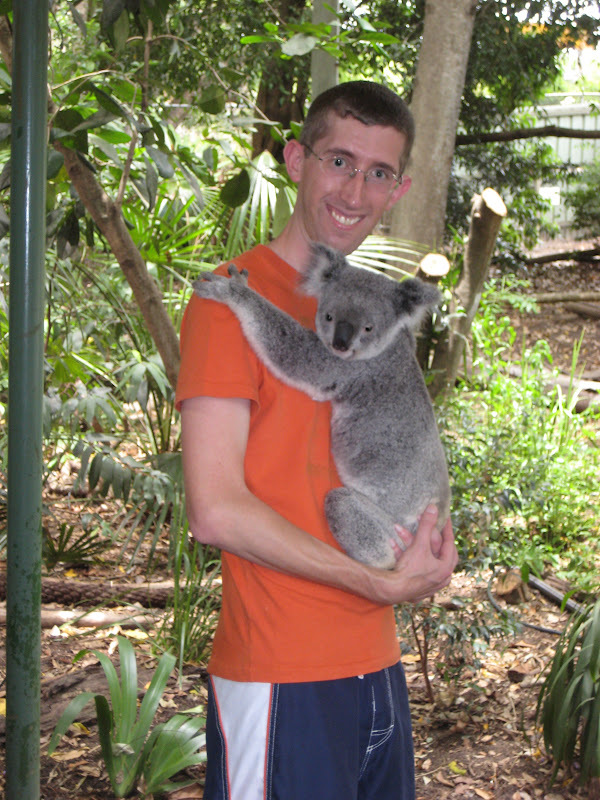 My mom visited this exact place when she came to Brisbane in 1971 and had her picture taken with a koala too! 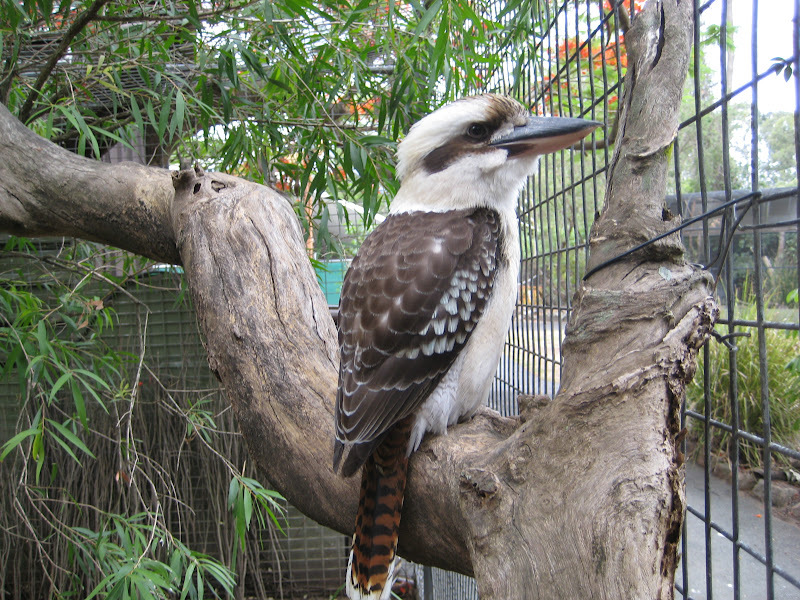 The zoo also featured a good number of birds. We attended an interesting "birds of prey" show. While we were eating lunch, a peacock just happened to wander up to get his picture taken with me. 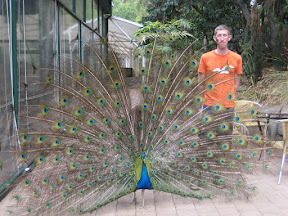 He was a little shy at first, but once the cameras came out, he was preening like nobody's business. He knew he was on display, and he was loving it. 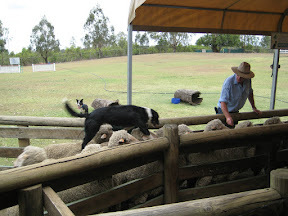 We also saw a sheep herding show where two border collies herded sheep around a paddock. Very impressive—they did a much better job of herding the sheep than I would have. 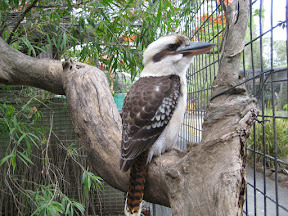 And just before the camera battery died, I got this picture of a laughing kookaburra in its cage. And shortly thereafter, the skies opened up in a torrential downpour, but we had finished seeing all the animals there were to see anyway. 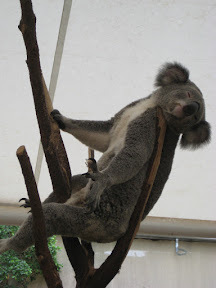 You can see some more pictures in my Lone Pine Koala Sanctuary gallery.